There's one caveat: you will need to have all the files you want to merge stored in one folder. 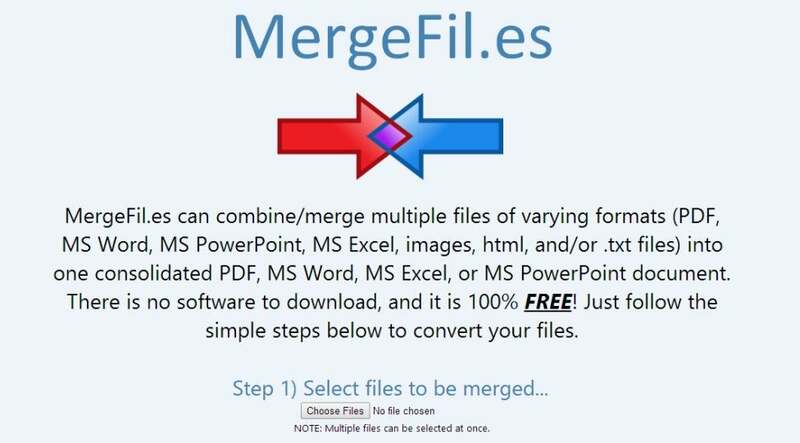 MergeFil.es doesn't let you select from different folders. Once you add all your files, choose the order you want them to be merged in by clicking the Up and Down arrows to sort the list. Next, choose whether you want to compress the output file to shrink its size (note this takes a little longer). Finally, click the file format you want the output in and MergeFil.es will download it to your hard drive. I found that MergeFil.es worked best when outputting to PDFs and Word files. For spreadsheets, it ended up putting each file as a different worksheet — that might not be the desired effect. Also, each image was put on a new page, even if there was room on the previous one. For those concerned about privacy, MergeFil.es notes that it saves the documents temporarily on the server and the files are discarded after use, and never shared with any other party.